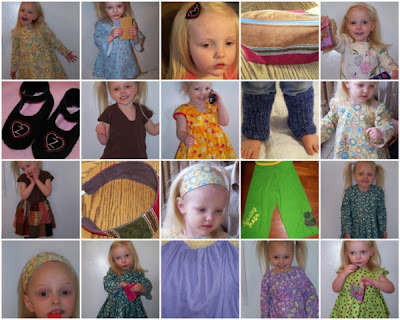 Bouncing Buttons crafts making it simple: January finished projects. Here is my mosaic of projects I made in the month of January. 7. Square neck T-shirt (made from old maternity tank) for Demi. 8. Strawberry top for Zee (my favorite). 13. Retro headband for Zee. 14. Embroidered kissing frog yoga pant for Zee (made from old maternity top). I know I didn't blog about all of them. Please forgive me and understand that I can't blog and sew at the same time. ;) I will try to find time this week to catch up but honestly that might not happen (I have a stack of sewing for this month piled up next to my machine already). I hope to remember to snap a quick pic of everything I make again this month. Happy Feb. crafting everyone!